Description: Restrictions apply on high capacity magazines in some jurisdictions of the United States, so please read this entire ad carefully before bidding or offering to buy. This listing is for ONE magazine. Here are all 14 specimens of factory Heckler & Koch Magazines we got from a Law Enforcement trade, 12 rounders to fit the HK USP-40C Compact pistol. 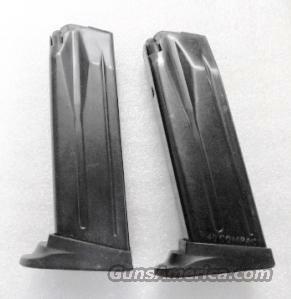 The drastic difference between these and current production 217439 magazines is, that these are serrated steel body. All specimens are German made, manufactured some time, by our estimate, around the Millennial Year. Construction is serrated steel body, with steel spring, black polymer cartridge follower, and black polymer spring base and finger rest type floor plate. Marking on the floorplate reads USP / 40C / HK [logo]. Marking on the forward section of the body reads Restricted Law Enforcement / Government Use Only 10-94 / Heckler & Koch GMbH – Heckler & Koch Inc / Made in Germany – Sterling VA. HK moved from Sterling to Trussville Alabama in 2004. Each magazine holds 12 rounds of .40 S&W caliber [or .357 Sig caliber] ammunition. These magazines will only fit Heckler & Koch model USP40C Compact, or special order USP357C Compact pistols; or P2000C Compact pistols chambered in .357 Sig or .40 S&W Caliber. They will not fit any other pistol. These magazines served in Law Enforcement. Surface detractions are moderate, with moderate amounts of insertion and ejection whitening and finish freckling; and contact scouring on the bottoms of the floorplates. We rate them as Very Good, 75 percent vicinity by our estimate, but photos ought to suffice for our distinguished shoppers to judge finish grade for themselves. They are excellent mechanically; spring strength and interior surfaces are clean. These are scarce magazines. Their polymer bodied descendants are not exactly plentiful, either. The point, of course, for going with a steel body against a polymer body is that the polymer bodies are more likely to bow outward and cause problems than the steel ones are. We’re offering these eminently serviceable Steel German made HK Magazines at only $33 apiece. Not for sale to civilian residents of California, Connecticut, D.C., Hawaii, Massachusetts, New Jersey, New York, or any other jurisdiction where 12 round pistol magazines are restricted to Law Enforcement.